SUNSHADE SPECIAL. Built for the personal use of sports and glider pilot Wolf Hirth of Nabern/Teck, this Klemm Kl 35 Spezial (D-EDEX) is a single-seat cabin development of the open, tandem-seat, pre-war Kl 35D. In place of the standard 105-h.p. HM 504 in-line is a 160-h.p. HM 506. The Klemm Spezial was photographed at the 9th International Exposition, Venice, 16th-20th July. THE ONLY ONE. 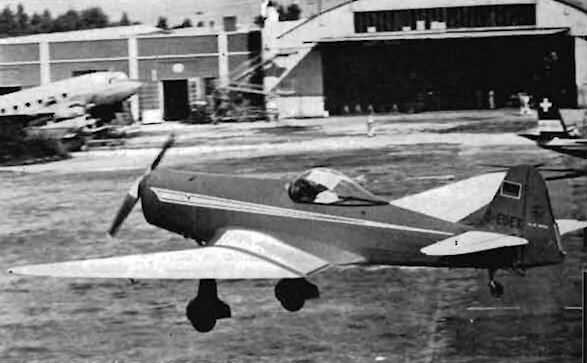 The last of a long and distinguished line of "Co." aircraft produced by the Societa Aeroplani Caproni of Milan, the five/six-seat Ca. 193 was flown for the first time in 1947. Only this single prototype was constructed. Powered by two pusher Blackburn Cirrus Major III in-lines, each of 155 b.h.p., the Ca. 193 has a max. speed of 186 m.p.h. at sea-level. Min. speed 65 m.p.h. Service ceiling 17,700ft. Weights, empty 2,685 lb. : loaded 4,185 lb. Span 45 ft. 3 in. ; length 29 ft. 6 in. ; height 8 ft. 2 in. The Ca. 193 was seen at the Venice Exposition in July.